Just as Siri serves as a personal assistant on your iPhone, Tempo wants to be a personal assistant for managing appointments and events. And with the latest version of its Tempo Smart Calendar app, due out Thursday, the company thinks it has just the offering to match your iPhone’s built-in Calendar app. The Siri connection is not coincidental. Like Siri, Tempo got its start as a research project at SRI International before being spun out as its own business. And like Siri, Tempo relies on artificial intelligence and natural language for its bag of tricks. The difference: While Siri is primarily aimed at answering the questions you ask, Tempo looks through your contacts, documents, and emails to bring relevant information to the meetings and events you’ve got booked on your calendar. Tempo Smart Calendar pulls info from your contacts, email, and elsewhere to attach relevant information to your meetings and appointments. By connecting Tempo to your calendar data, email client, and address book, the app pulls data for the events you’ve scheduled, making them accessible directly from your calendar listings. The app can even grab related documents, let you browse LinkedIn profiles for meeting attendees, and provide directions and estimated driving times to where you’re meeting. On top of that, Tempo already offers a number of impressive features. For instance, there’s a button you can press to let meeting participants know when you’re running late with just a few taps, saving you the trouble of having to pound out an apologetic email. As someone who finds himself on the business end of a lot of conference calls, I also like Tempo’s ability to store passcode information—just tap a button to enter that code when prompted rather than having to remember a string of digits. As nice as those features are, though, earlier versions of Tempo suffered from a few notable limitations. 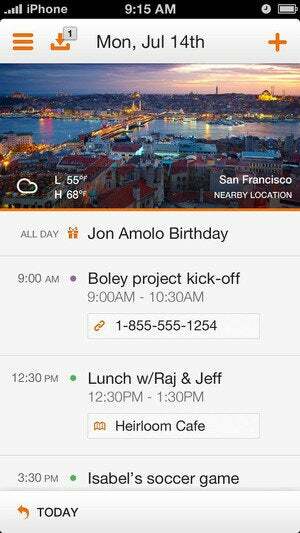 Version 1.0.8 of Tempo Smart Calendar looks to change that. Released Thursday, the update adds a number of small-yet-significant features designed to more fully flesh out the app. One of Tempo’s handier features is an I’m Running Late button that lets you alert other meeting participants. 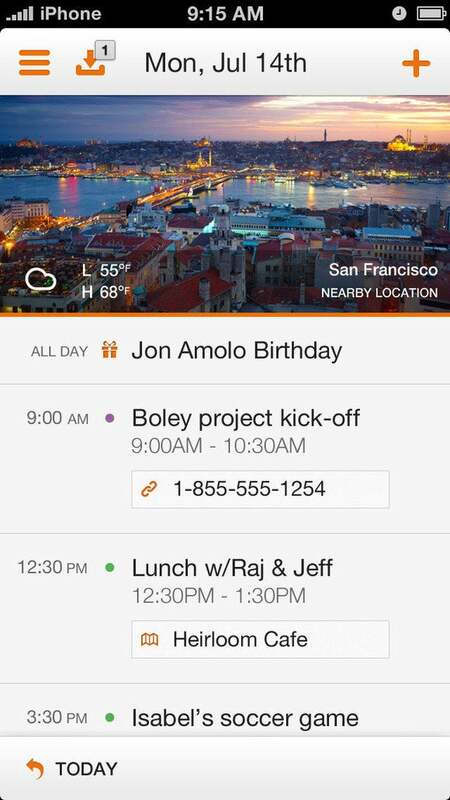 It’s a welcome set of enhancements that should improve upon an already solid calendaring app. That said, Tempo isn’t without some quirks. In my admittedly limited time with the app, I found the suggested location feature to be more confusing than helpful. For my daughter’s weekly swim lesson, for example, Tempo suggested that we meet at a restaurant with a name similar to the athletic club where my kid learns to paddle and kick. This is, of course, just a suggested location and indicative of Tempo’s stated mission as a way for primarily managing business meetings. Even so, the suggested location for a check-in meeting with my boss, whose office is less than a dozen steps from my desk, was a restaurant 27 minutes away by car. Using Tempo more will fix a lot of this, of course, as the app uses its artificial intelligence to learn more about me and my preferences. Also, in its initial releases, Singh says, Tempo has shied away from explicit learning in which users train the app, as that often proves to be a turn-off to adapting new technologies. That said, the ability to edit locations may find its way into a future version of the app. Still, Tempo offers a promising calendaring tool, particularly for business users unimpressed by the lackluster Calendar app that Apple includes on the iPhone. The additions delivered in version 1.0.8 provide even more reason to give Tempo a shot. Tempo is available for iPhone users in the U.S. and Canada, with plans to eventually expand to other countries. The app requires iOS 5.0 or later.